Argentina's greatest footballer of all time Diego Maradona has pleaded with country man and current Argentina captain Lionel Messi not to retire from International football following Argentina's Copa America Centenario final loss to Chile. After losing his fourth final for his country - after the World Cup two years ago and the Copa America in 2007 and 2015 - an emotional Messi said: 'That's it. It's over for me with the national team. 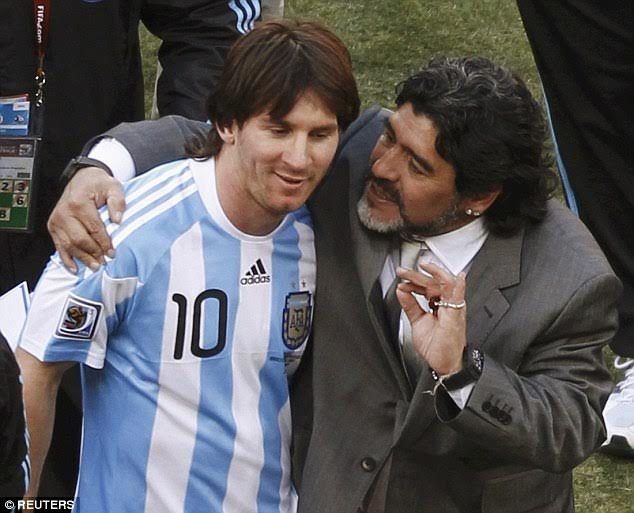 But Maradona has urged the Barcelona man to think carefully about his future. Messi's plan to retire comes as the Argentine Football Association (AFA) implodes after the AFA's presidential election was recently marred by controversy and uncertainty.